The theater production "Ogu", starring Korea's leading veteran actress Kang Boo-ja, will be staged at the Geomdan Hall of Hanam Arts Center on November 22. The play, which premiered at the 1989 Seoul Theater Festival under the title "Good Bye", was directed by Lee Yun-taek in 1990 and has since received a consistently favorable response from local audiences. 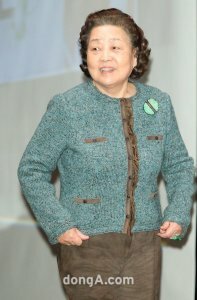 The popularity of the play went to a whole new level when Kang joined the cast herself as the old mother in 1997. That year, the play attracted a total of 2.6 million audience members. The play takes a look at the tragic and painful elements of death from a humorous perspective. The story begins on a leisurely afternoon in a quiet agricultural village. The old mother has a premonition about her own death and begs her children to hold an Ogu gut ritual so she can safely pass on to the next world. During the gut, she passes away and the quiet house suddenly becomes a house in mourning. But the house also becomes a space filled with grievances, as well as festivities. A petty dispute between the children over the inheritance suddenly ignites amidst the chaos. The incident comes to an end when the spirit of the dead mother appears and scolds her children.